Ah Mariah Carey, why did you mess up your NYE performance? Was it really a technical issue as you suggested? Hey, it could've been, I will never know. However, that made me real nervous going to see her and Lionel Richie at Rogers Arena. To our surprise, she was pretty good and even brought her kids onto the stage. Although not being as engaging as Lionel Richie, I was more than happy with some classic Mariah belting out top-10 hits. 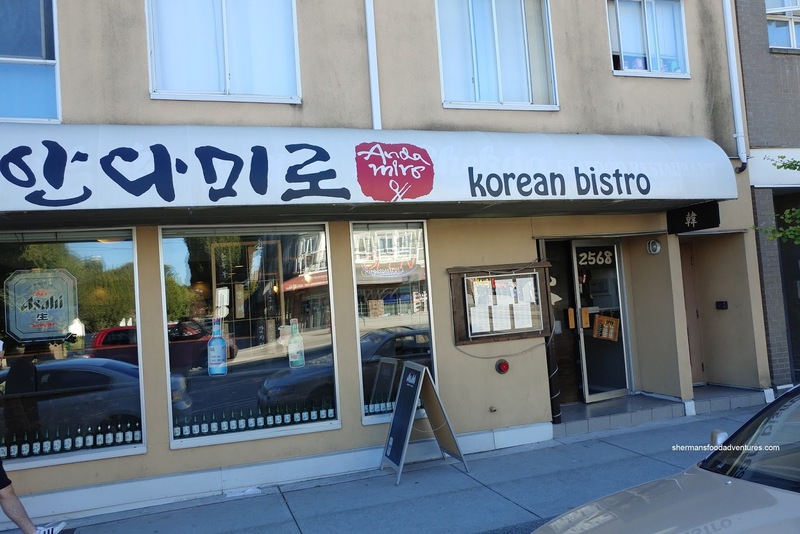 Prior to this, we met up with Costanza and Elaine for some pre-concert eats at Andamiro Korean Bistro. 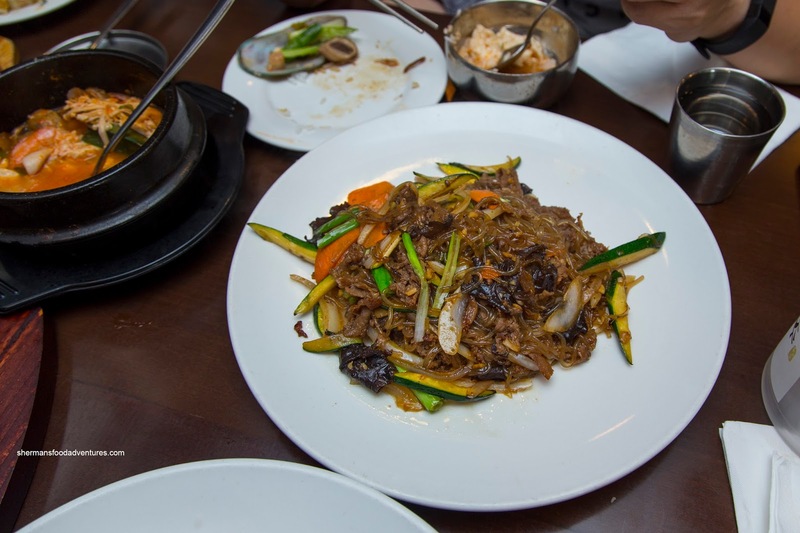 Costanza raved about their Sura-like multi-course menu for cheap. To our disappointment, they halted the fabulous deal indefinitely (more like forever). 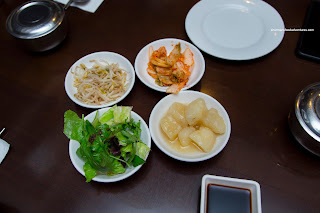 But that didn't stop us from getting another combo that started with the usual Banchan consisting of stewed potatoes, sprouts, kimichi and green salad. These were pretty average with overly soft (practically disintegrating) potatoes and weak-tasting kimichi. Even the sprouts were pretty bland. Oh whatever, these weren't the main courses, so it didn't matter much. For our first item, we had the Seafood Pancake presented in the usual cast iron plate. It was a fairly thick version, yet at the same time, not overly dense. There was a decent amount of seafood while the green onion was not distributed evenly. Some parts had a tonne while others had barely any. On the outside, it was crispy and easy on the grease. Probably my favourite dish was the BBQ Short Ribs as they were not only aesthetically-pleasing, they were executed almost flawlessly. 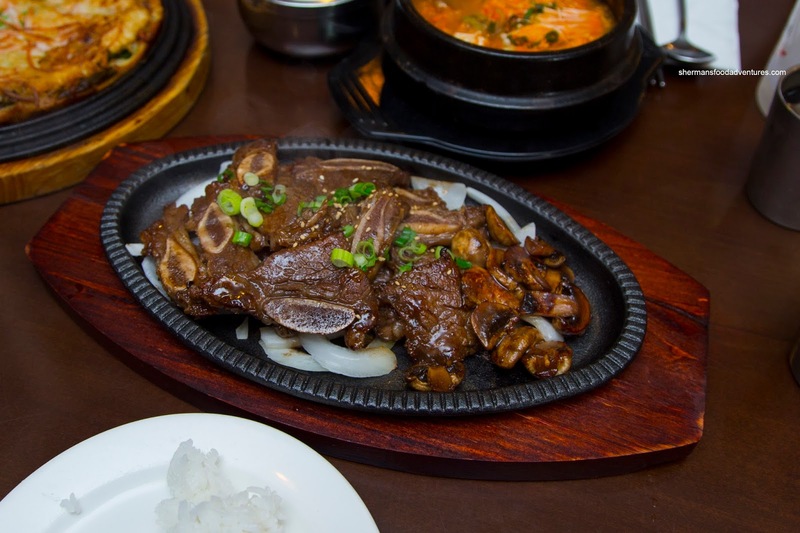 Beyond the sweet and smoky caramelized exterior, the meat itself was tender and succulent. Other than the chewier parts near the bone, the meat required very little effort to eat. I thought the marinade was on point as it was flavourful without being too sweet nor salty. It went well with the supplied rice. Even the grilled mushrooms were tasty. 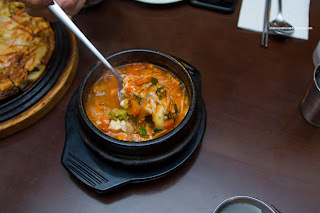 Bubbling hot, the Seafood Tofu Soup was pretty textbook with the usual ingredients including silky tofu, egg, seafood and veggies. The broth itself was mildly spicy with the brininess of seafood. There was actually more ingredients than broth. Again, this went well with the supplied rice. The last item of the combo was a medium-sized portion of Japchae. This was subjected to a good amount of wok-heat (or pan heat) where both the colour and aroma were caramelized. It was sweet, but nicely balanced by an equal amount of savouriness. Unlike some clumpy versions, this one had enough moisture to keep the noodles apart without being soggy. However, some of that moisture was actually oil (so the dish was a bit greasy.). 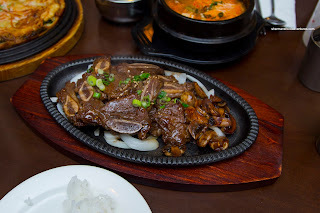 There was a good amount of tender thin-sliced beef and vibrant veggies as well. 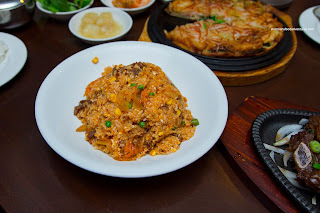 Not that we needed more carbs, but we also added the Kimchi Fried Rice. This was pretty tasty as it also exhibited great wok heat where the rice was chewy and nutty. It was also moist with enough kimchi and spices for impactful flavours. 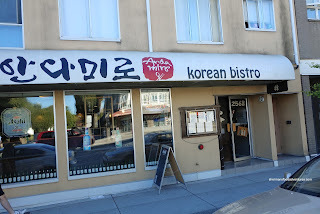 I wondered why this tasted so much better than the kimchi that came the banchan. 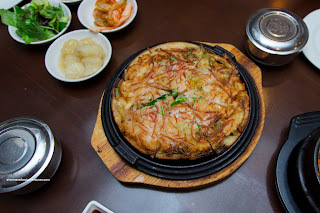 For good measure, I ordered the Bossam (that was curiously devoid of Romaine and the other accompaniments). Whatever the case, the simmered pork belly was tender, fatty and gelantious. 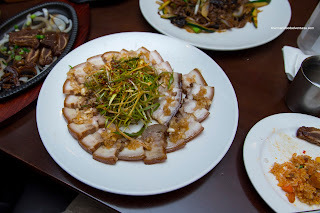 It was tasted with a rich pork flavour that was accented by equal parts sweet and saltiness. Loved the raw garlic on top, it added a tangy sharpness. Although we didn't get to try the combo meal at the front of their menu (which they claimed was temporarily unavailable...), the food we did try was good and worth another look see in the future.